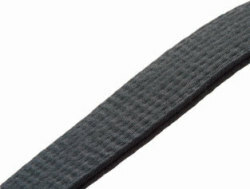 A regular 4cm wide cotton black belt. Normal thickness and easy to tie. Ideal as an economical belt for new Shodans, children or as a spare belt for seniors. See here for further help. Please contact us if you require a LARGER size belt. Please enter your name, and embroidery preference. Please read here for further information. Transliteration of your name to katakana will be done for free. Note: initials cannot be done in Katakana. See here. We have a list of common style and association names in kanji. To select your style/assoc., please select kanji as the language or click here. Require kanji? If your style/assoc. is not on the list, contact us. Do not require kanji? Enter your style/assoc. as you wish it to appear in alphabet. Dan stripes can be embroidered on the front face of the belt, under your name or association. Please select the number, color and location.